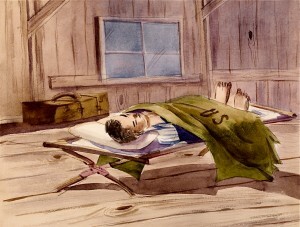 This painting depicts an evacuee lying on his cot in the shabby internment camp. He was covered by an olive green sheet marked U.S. There were no other decorations and facilities in the room except one suitcase. Theme: Tough living conditions in the internment camp had caused physical and psychological ramifications on the evacuees. The placid-looking Isao, after the enduring and exhausting struggle with camp administration, was dreaming of a peaceful new life. Indicated by the military blanket, Isao may either leave for the army, or go back to the society after serving in the military. Myer, D.S. (June 1943). Evacuee Resistance to Relocation. War Relocation Authority, Community Analysis Report No.5. 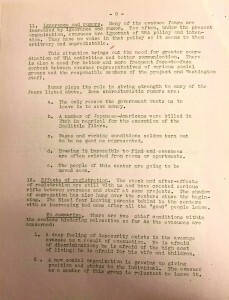 The primary document is a report investigating the difficulties that Japanese American encountered in the camp and their reluctance to relocate. The relocation guide committees sought to use this report as an reference to create effective strategies to encourage relocation. As a constructive measurement of the current situation, the report offered a comprehensive evaluation of evacuees’ mental status and their reasons to resist relocation. The reasons were complex and diverse, and can be categorized into two groups. One was the deep feeling of insecurity, including fear of discrimination, financial insecurity, uncertainty of resettlement, citizenship worries, and fear of unemployment. Another was the reluctance to lose the new social status they gained in camp, including fear of social reorganization, fear of losing family and community bonds, ignorance and rumors. What behind these reasons were the shock of evacuation, mental, physical and social disorganization due to life of camp, and their distrust to the government. For evacuees who lost most of their belongings and were isolated from the main society for such a long time, the outcome of relocation and the future in the outside world were highly unpredictable. The painting of Gene Sogioka entitled “Isao’s last night of Internment – A New Life” read together with the Primary Document are just some of the materials that depicted one of the most turbulent period of the Japanese American incarceration chapter of the War World II, in particular the resistance to the relocation program offered to the Japanese American evacuees. 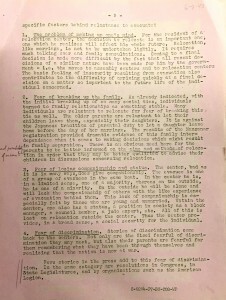 The distrust and the anxiety of the internees could stem from the poor physical condition of the camp and the government policy aimed to test loyalty and promote assimilation. These had led to some internees to express resistance to the relocation when the time has come to close the camp. 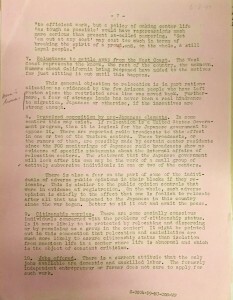 Apparently, the Issei generation appeared to be the group that showed more distrust and bitterness towards the US government as a result of the government policy that was made in favor of the Nisei generation. As for Isao, being a second generation Nisei, the painting may suggest that he opted to join the US military or to accept the relocation after serving in the army. His choice to serve in the military may be motivated by the desire to escape from the camp, the uncertainties of the relocation, and his adaptation to disciplined life. There is also the possibility that Isao may choose to accept the relocation after returning from the military service. No matter which one of the decisions he made, there are doubts that despite being a “Yes, Yes boy”, his true feelings towards the US government may be truthful. Isao may still harbor anxiety about the looming uncertainties of his future. Hence the resistance to relocation may still be present in the Nisei generation, although to a lesser degree than the Issei. The Japanese Americans cannot escape the stereotype of being the enemy who started the Pearl Harbor attack. Since their arrival in America, Japanese Americans had been struggling against the long anti-Japanese hostility created by labor competition and racial discrimination for decades. In 1940s, this sentiment against Japanese immigrants reached its peak. Due to the Pearl Harbor attack, and the ambitious military expansion by Japan, the Japanese immigrants became the target of hatred of many Americans and were considered as “dangerous spies” and “enemy aliens” by the people and government. Finally, on Feb 12, 1942, President Franklin D. Roosevelt passed the “Executive Order 9066” that excluded Japanese Americans and empowered the government to send one third of their population to internment camps. The Internees lost their homes, properties, possessions, and jobs as a result. When the war was about to end, the U.S. government decided to relocate the internees and created relocation program. 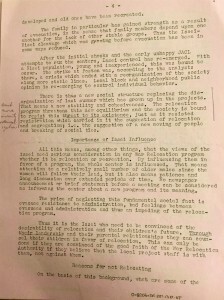 Many evacuees expressed their anxiety with and resistance to the relocation program. In Gene Sogioka’s drawing entitled “Isao’s last night of Internment-A New Life,” an evacuee was sleeping alone in the simple and crude camp. The loneliness and melancholy in the drawing reflected his fear of an unknown future. For the internees, the outcome of relocation was highly unpredictable. 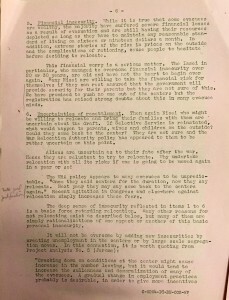 According to WRA Community Analysis Report No.5, “Evacuee Resistance to Relocation”, the reason behind evacuee’s reluctance included the deep feeling of insecurity and fear of losing existed social status. 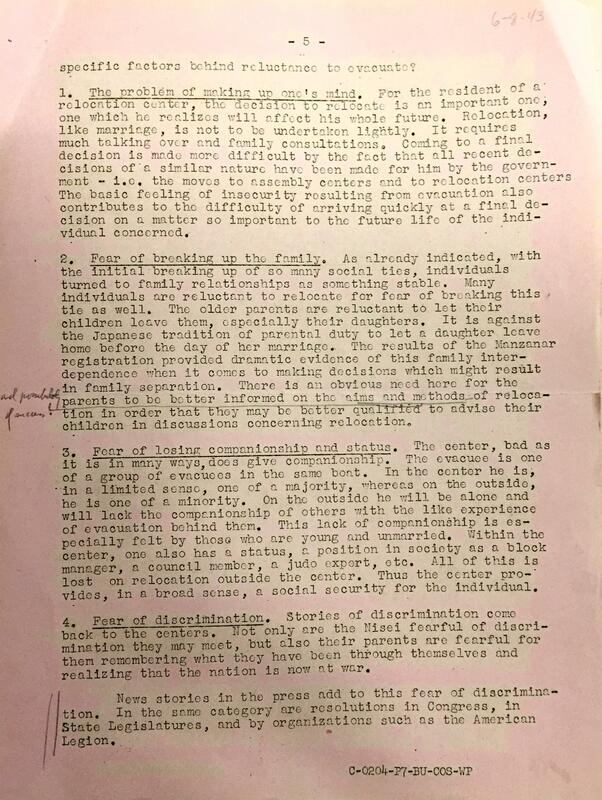 In the following passage, we will discuss how the physical conditions and government policies to test loyalty and promote assimilation led to internees’ resistance to relocation. Evacuees had a very difficult time adjusting to the bare environment in camps. Usually located in the desert or swamps, the harsh condition of the camp shocked everyone when they first arrived. As Sogioka said:” It’s just an empty land, nothing”. Also, the weather and housing condition was harsh. Internees had to bear burning summer and frigid winter, as well as fierce dust storms in small and rough accommodation, such as the one in the watercolor painting. 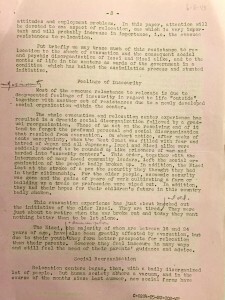 According to WRA’s confidential report, there was “too much confinement for a small area with 10000 people.” Internees were assigned to a block consisting of fourteen barracks, while each barracks were then divided into 4 or 6 rooms; the room for a family with six members was only 25 feet. Such a small living area increased the anxiety and offered little privacy to the internees. Also, the internees had to build their own furniture from wood and garden supplies. Besides, people were complaining about the unappetizing and unfamiliar food, and tedious and underpaid jobs. During months or years of incarceration, the internees had gradually accustomed to the bare conditions, and thus were reluctant to relocate, which may lead to a worse environment. The distrust to the U.S. government also contributed to the resistance to relocate. 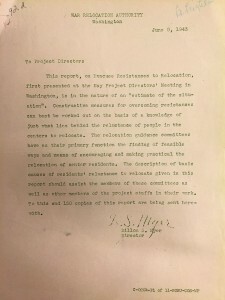 A series of ineffective and inappropriate policies to foster assimilation and to test loyalty did not receive unanimous support from the internees. 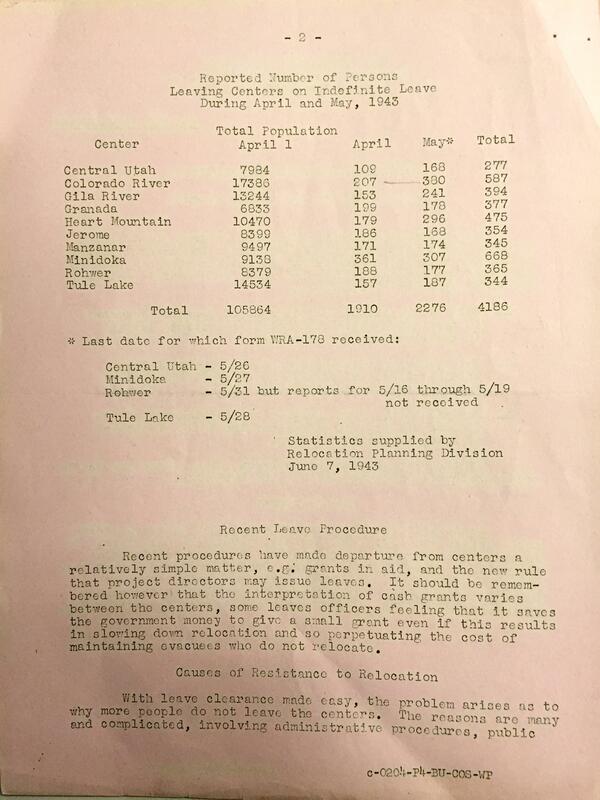 The evacuees showed little cooperation with the administration, especially the WRA. These were the two major failures in government actions. First, U.S. government tried to assimilate Japanese Americans in a crude way that hurt internees’ self respect and pride of the nation. 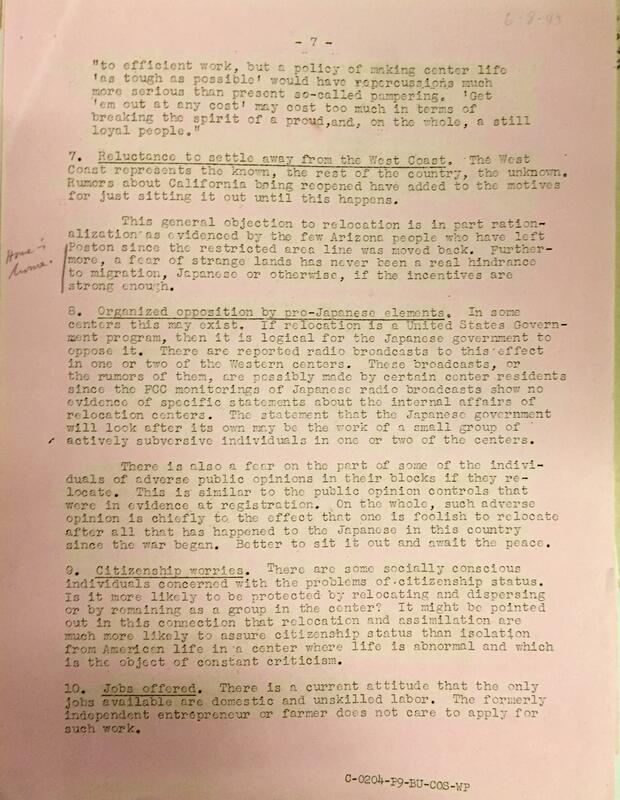 In order to “praise American democracy,” the administration only offered the limited community positions to American citizens (mostly Nisei) and thus keyed up the existing tension between the first and the second generation Japanese Americans. Some of the government policies went as far as to ban the Japanese-language school and prohibit the use of Japanese in public meetings. These actions created strong dissatisfaction among the evacuees, especially the Issei who were being disempowered. 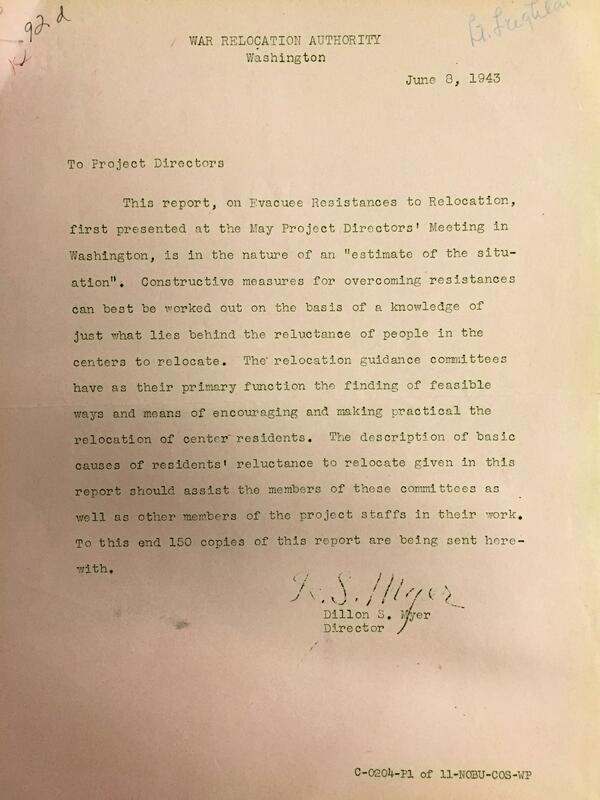 Second, the WRA used questionable strategies to test the internees’ loyalty. 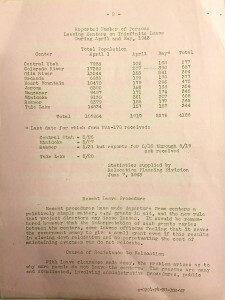 One significant example was the Loyalty Questionnaire distributed on Feb 12, 1943. In the questionnaire, there were two problematic questions asking about the willingness to attend military and to defend America from Japan. 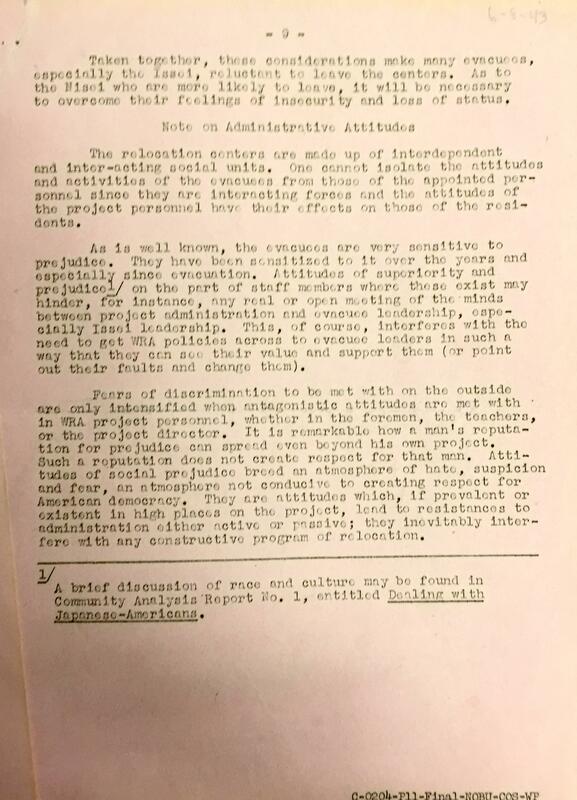 While “No No boys,” who answered “no” to both questions, in belief that those in camps should not be drafted by a country that incarcerated them, other internees answered “yes” in the questionnaire conducted and attended the military. Depending on his answers to the question 27 and 28, there are two possibilities of Isao’s future: either to join the U.S military or to relocate after serving in the army. Indicated by the olive army blanket over Isao, after this last night in the camp, one possibility for him was going to the war. Recalling the two controversial questions in the loyalty review program, Isao’s answer was “yes” to both, so that he was qualified as “the compliant and the hopeful” candidate to serve in the army. However, the two “yeses” may not reveal Isao’s true intention. The situation is hard for us to hastily conclude the psychological process that Isao had gone through. I doubt his answer was given completely based on his loyalty to the U.S., forsaking any attachments to Japan. In my opinion, his decision to serve in the army may result from any of the three: the desire to escape from the camp, uncertainties about relocation, and his adaptation to disciplined life. First, as discussed before, it is probable that Isao suffered greatly from the physical living conditions in the camp. His failure to adapt to American diet, intolerance of the diminished privacy within the camp, and isolation in such a remote place, various factors of this sort may have pushed him to volunteer for the military. By moving to a new environment, Isao was expecting a better living condition and a change into a new life. In addition, it may be some fears of resettlement into the U.S. society that led to his decision. 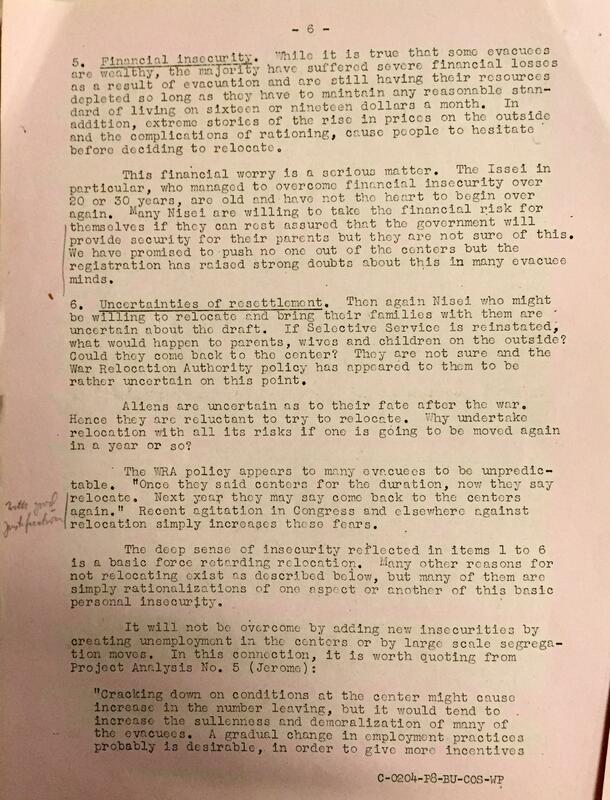 In the WRA Report on the issue of evacuee resistance to relocation, it mentions that financial insecurity was one big concern for the evacuees. 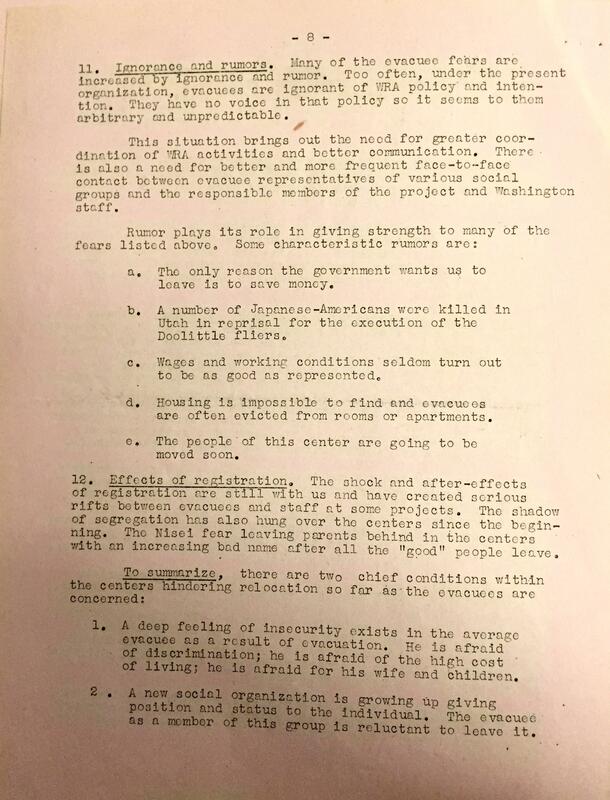 Significant loss of wealth upon the arrival at internment, extreme stories about rising prices in outside society intimidated evacuees to be relocated. Besides, the uncertainty to find a proper job outside with only domestic and unskilled labor work increased their resistance. By comparison, going to the war might appear to be a better choice for Isao. By serving in the army Isao neither had to worry about finding a job immediately after incarceration, nor facing the rising living price in the society. Another concern for evacuees as Isao to relocate was citizenship worries. His citizenship was more likely to be assured if Isao went to the military and fought for the U.S. This seemed to be a good way to show his loyalty to the nation, and that he was not the “enemy”. Thereby his citizenship status could be protected. 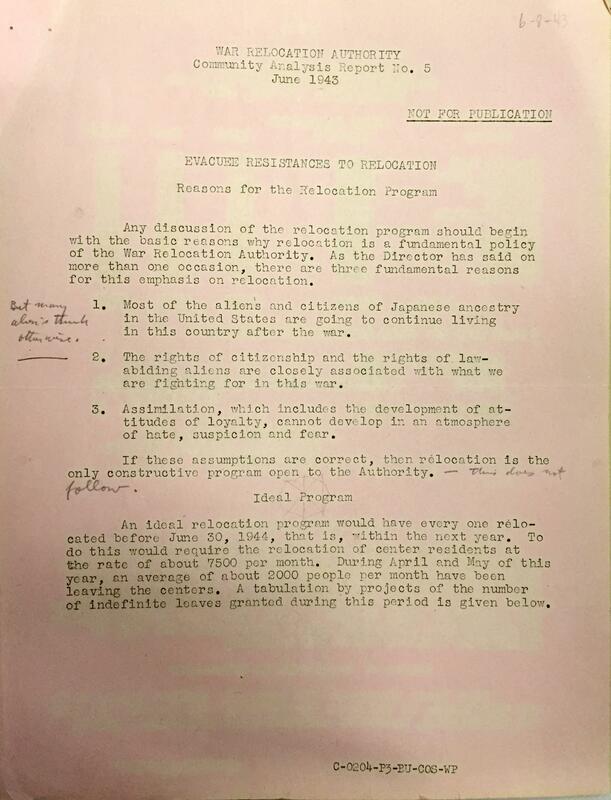 Furthermore, by going to the war for the U.S. may help to appease the white racism toward Japanese, thus making them more embraced by the white society and truly accepted as U.S. citizens. The last reason shaping Isao’s decision might be that, although having tough experience during the internment, Isao may have already become accustomed to the disciplined life in the camp. Getting used to follow orders from the government, Isao may attempt to avoid triggering any more hatred from the white society. In addition, he might be intimidated by the FBI arrest if he refused to go to the army. After the announcement of interned American citizens conscription for military service on January 20, 1944, the FBI used arrests based on questionable evidence as one way to stop the resistance of conscription. So as a result, instead of going back to the society with no clue where to start over, he may be more willing to continue an institutionalized life in the army. Another way to interpret the painting is for Isao to leave the camp to start a new life. Premised on the Sogioka’s painting, Isao appeared to have demonstrated his loyalty to the United State by enrolling in the military service and to have dutifully served his term. Subsequent to his return from the service, Isao took part in the relocation program. Historians documented the most upheaval internment chapter was arguably the ‘defiance’ of the closing of the camp because of the prospects of relocation. The various resistance was duly documented in the primary document. Nevertheless, would any of the resistance to relocation described in the primary document and in Murray’s article apply to Isao? Unlike the Issei who were adamant to the relocation program, Isao’s level of resistance to the relocation may be much less than the Issei generation. 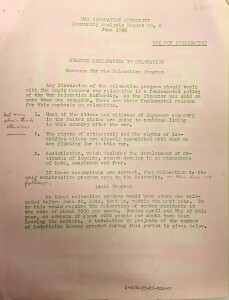 Isao’s positive outlook can be drawn from his loyalty to America by his willingness to shed blood for a country that imprisoned him and the other Japanese Americans as mentioned above, as well as his awareness that the American government trusted the Nisei like him more by giving them more opportunities and resources allocations than the Issei generation. Despite the favorable position he was in, it may not be alarming for Isao to harbor anxiety towards the departure from the camp to the real world. Judging by the treatments to the Japanese Americans after the Pearl Harbor, which were the slew of unpleasant physical conditions in the camp and the government policies, it would be understandable that one does not forget the experience in the internment period. Isao would remember the emptiness of the barracks, the dust in the summer and the standard bear minimum furniture assigned to the residents of the camp. Arguably, these unpleasant camp conditions may be an impetus for agreeing to the relocation. However, the internees’ dissatisfactory experience in the camp was the same in other camps too,  and consequently may question the next place that they were located with similar poor condition. All these may create a greater negative perception of the government’s relocation program for Isao. He may share the same sentiment as the other internees. Hence he might possess reservation to the relocation. 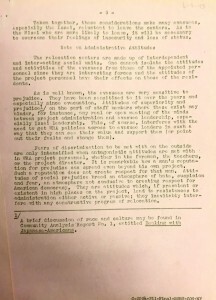 With regard to the government policy in the camp, as mentioned above, such as financial insecurities, and lack of employment opportunities were just some of the bitter chapters in the internment that would exacerbate anxiety to the relocation program for the internees, including Isao. The treatment received would undoubtedly be of concern to Isao and hence he would be apprehensive of agreeing to the relocation. 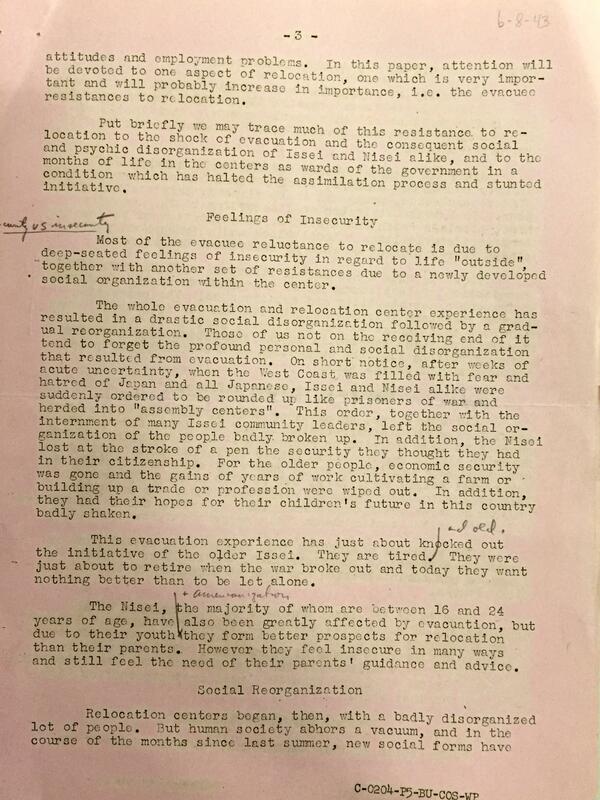 According to the camp psychologist, Dr Alexander Leighton’s observation, he was of the view that the internees faced uncertainties in their future, especially other Americans were going to perceive them as enemies, as though they were the ones who started the war. 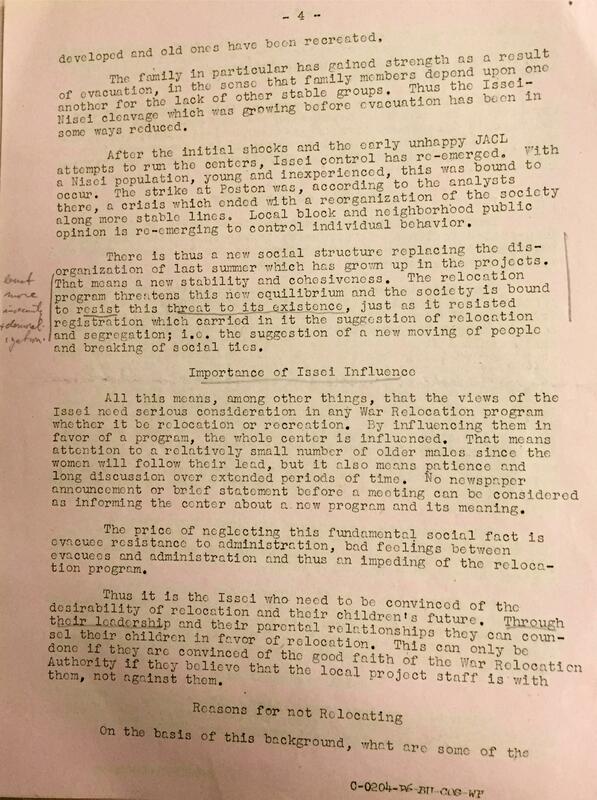 With this in mind, the relocation program would not be construed as a promising turning point for the internees, but rather the relocation could be another similar challenge they had endured in the camp. Despite his patriotism to America in the military service, Isao may still be apprehensive about the relocation, because of the stereotype the Americans will use against him, purportedly being a Japanese who started the Pearl Harbor attack. In conclusion, we can interpret the watercolor painting of Isao’s last night in the camp as his pre—departure for the army, or for the society after serving in the military. In both cases, the painting indicated bare camp conditions and policies implemented on Japanese Americans during WWII such as loyalty test and assimilation. In regard of the two factors, we can further perceive the various worries of relocation and uncertainties of future among internees as Isao, which ultimately led to their apathy and resistance towards being relocated. Chrissy Lau, “World War II and Incarceration” (speech, Ithaca, NY, October 20, 2015).